Discover the world and meet new people with our Romanian course! Travelling to Romania is a really great idea! This country has unique medieval castles and small villages where you can experience traditional life in Romania. The Romanian cuisine is a mixture of East European and Slavic influences and the local Romanian dishes that is worth trying. The Carpathian Mountains are home to many interesting birds and animals species with picturesque views, fresh air and a peaceful environment. An interesting fact about Romania is that it's capital, Bucharest, is home to the heaviest building in the world - the Parliament and you should definitely include that in your touristic spots list for the trip to Romania. Some of the best places to visit in Romania are the UNESCO protected churches and monasteries. Pack your baggage and let's start the journey! It will be easier to travel to Romania if you know some basic words and can speak Romanian. This will help you in many situations. You can use our Romanian course to learn the Romanian words and useful Romanian phrases that you will need to order food, shop in a store, ask time or the way, buy a ticket and not only! The course includes the Romanian greetings, you will learn Romanian hello, how to say thank you in Romanian. Also, if you're wondering how is please in Romanian or how to say good morning in Romanian, you will learn it with our Romanian for travelling course! Each flashcard includes the Romanian to English translation, for you to understand the words well and know how to use them. If you plan on visiting Romania for a longer period or want to know more Romanian, proceed to our Romanian in 1 day course and learn more useful Romanian words for all situations! There is also a day 2 course to assure you know all the Romanian vocabulary you will need. 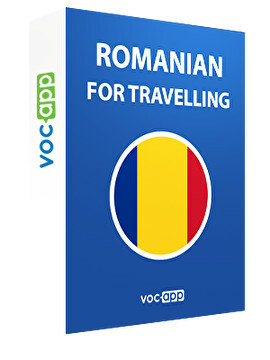 Learn Romanian with VocApp and impress the natives with your knowledge!